A while ago I bought some white waffle cloth. When I made dish towels last year I thought it would be good to make some dish cloths too, but I ran out of time. 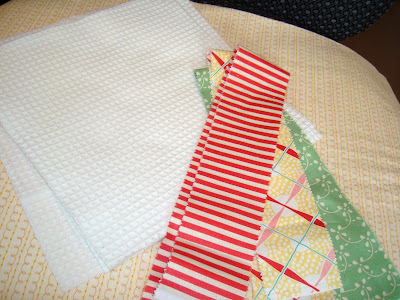 I finally took an evening a couple weeks ago to make these dish cloths and it was really easy and fun. I've since found out that (of course) I'm not the first to make these waffle dish cloths. Lynn (thanks Lynn) let me know that Amanda Jean had written about this on her blog too. But I thought I would post about mine anyway. What the heck. You can buy waffle cloth from many sources. Hancock carries it and Moda makes some waffle coth too. You can also get it here, here and here among many sources. It comes in several colors and textures/patterns. 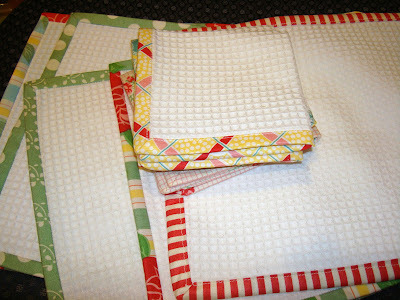 Lynn and the Amanda Jean post let me know that it is best to wash the waffle cotton BEFORE sewing into dish cloths. Unfortunately I didn't think of that before hand and haven't washed mine yet but I'll certainly prewash before making my next batch of dish cloths. 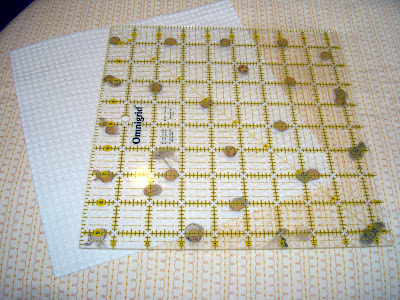 I used my 9 1/2" template to cut the waffle cloth into squares. I'm always looking for ways to use "left overs". I used extra Jelly Roll strips from from the Moda Sweet line. Don't we all have extra Jelly Roll strips hanging around? Yes. The 2 1/2" strips worked out just great. There was enough length to join the ends of the binding with a bit to spare. 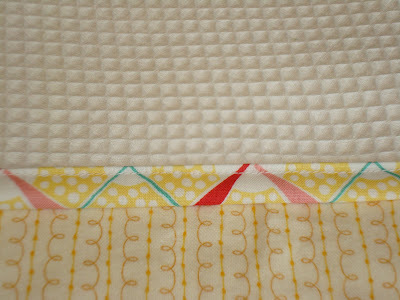 I just sewed the strip on the waffle cloth like regular quilt binding. Then I pressed the binding flat and then pressed it folded over to the back of the cloth. I top stitched some of the binding, stitching on the front so that it caught the binding on the back of the dish cloth. And some of the dish cloths I stitched in the ditch, catching the stitching on the back of the binding. I think either one worked well and it would be a personal preference which method to use. This is a view from the back where you can see the stitching is close to the edge and does tack the binding in place. Here is another view from the back. It was an easy project and it makes a very simple and inexpensive gift. I used them last weekend to give to my sisters and friends along with some great smelling countertop spray I bought on sale here. And no, I didn't pay the price they have listed. They're very cute Nanette. Of course! 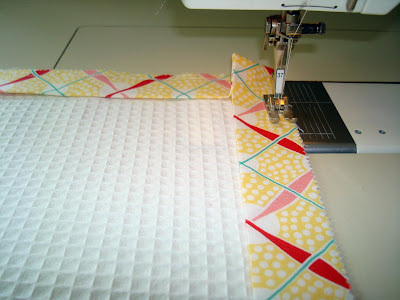 I've spent the last three Tuesdays learning how to longarm quilt and using quilt tops destined for the charity closet at the guild as my guinea pigs. 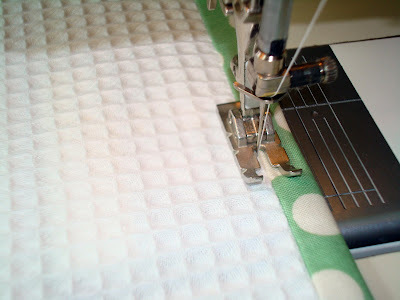 I think this post just gave me the 'permission' to machine sew all these bindings I have building up in the hand sew pile. Done is better than perfect, right? I love my dishcloth...and the countertop cleaner is the most wonderful product...I have black granite countertops...and it makes them shine!!! I love my dishcloth! Thank you again for the lovely gift along with the countertop cleaner. I used it this morning and my kitchen smells wonderful. Well after reading nan's post I guess I will wait a while to get the waffle cloth. I saw what a wonderful day you had on Sat. with you now "real" blogging friends. I am so happy for all of you, what fun. I also need to get the cleaner you suggested, what scent do you get? I am going to search high and low for waffle cloth this coming weekend. Nice tutorial Nanette. 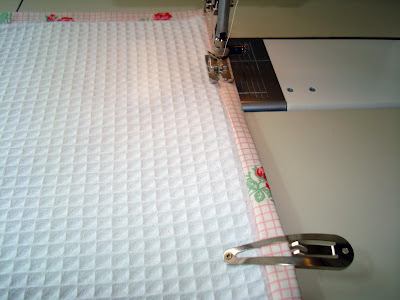 I used the waffle fabric for dish towels a couple of years ago. I raw edged appliqued cute pink flowers on. I DID NOT prewash the waffle fab. and was very disappointed, plus it isn't very soft for drying hands. I was so surprised at 'how much' it shrank. I think it would definately be better for dish CLOTHS, not towels. Thanks. Those cloths are so cute, and quick too! Much quicker than the crocheted dish/wash cloths I've been making lately! I love the fabric trim on them. i SO wanna make some!!! and the sweet line is perfect!!! Cute, cute and cute!!! I love those - will have to look for the waffle cloth. Nanette, thank you for sharing, really like this idea and such a great gift. Nanette, I love my dishcloth and cleaner!! It makes my countertops shine (just like you said it would) and my kitchen smells wonderful!! Thanks too for the tutorial on making the dishcloths!! I had a wonderful visit! Thanks Nanette! 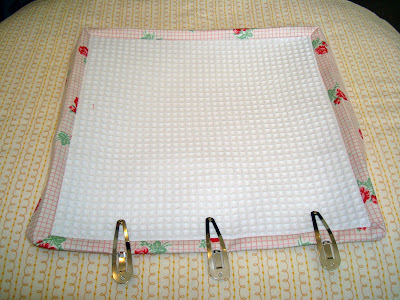 I love making these - great to sew the binding while watching tv. Something small I can accomplish in a short time. Sadly though I only watch one show so I don't get many done. Maybe I should start watching more TV! I'm really tired of my crocheted dishcloths. These look awesome. They are absorbant?? Way cute and very easy looking!! Thanks Nanette. Wouldn't they make great hostess gifts and stocking stuffers? 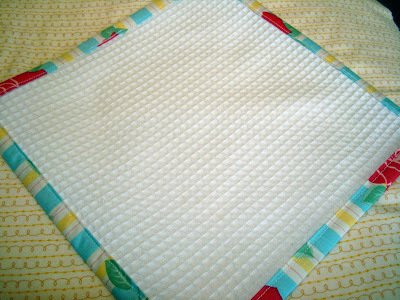 There's something about white waffle cloth that looks so clean and refreshing. Gotta get me some. Sounds like y'all had a super time at your girl-y get together. Aren't they the best? I LOVE these Nanette -- they're SO cute! I do have to answer "no" to your jelly roll question though -- can you believe I've never purchased one? I guess we're slower to join the party back here! 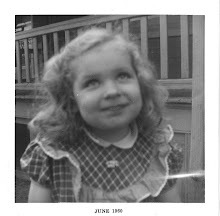 Welcome back, Nanette - see my acknowledgement to uou on my pinwheel tutorial! Thanks for the advice to pre-wash the waffle cloth - the dishcloths are too nice to use! What a fantastic idea! Great gift idea...waffle dish cloth, yummy smelling kitchen cleaner.....maybe even coordinate in an apron. Thanks! Nanette....I love the dish cloths. You have wonderful ideas that inspire me! Keep up the great work! Nanette, What a fantastic tutorial! I love these and saw them showing up around blogland as little gifties. You are so sweet and talented. Oh these are fantastic! Thanks so much, I'll be linking. I loved the tutorial and the dishcloths are wonderful! These are cute! Thanks for the tutorial. I'm glad you had a great time getting away. We all need that every once in a while. So lovely! They would make wonderful gifts. Those are great towels. What a good idea to put those beautiful edges on them! I love that "Sweet" line! I have tried to go to the site to look at the Friendship Block and the Pineapple Applique Block from the March guild meeting, but nothing shows up when I get there! What am I doing wrong? I missed the meeting, so I would love to see the blocks. Thanks for the great idea. I really don't care for the dish towels I buy so I'll have to try these. Years ago I bought yards and yards of the toweling they use to used in the cloth towel machines in restrooms. I like to make dish drying towels out of it. Now I can make matching dish cloths. They look great. I sewed some fabric onto some flour sack towels at Christmas and the flour sack towels were just a little wonky so they didn't end up half as nice as yours. I will do them your way next time- thanks for sharing! (again!). These are beautiful - thank you for the tutorial! i just started using my dishcloths that i made last september. i love them. :) i never in my life thought that i would be using moda fabric to wash my dishes, LOL. Once again, Nanette, you have come up with a lovely gift idea that is easy to make and oh so useful - thank you for sharing it with us! I have never heard of Caldrea, and am looking forward to trying their products. Hi there! I love this idea. My brother and his fiance just purchased their first home. When I saw your post I thought this would be a great house warming gift. I am having trouble with the binding though. Did you use a walking foot? These are so adorable. I am putting this on my growing project list. I just wanted to say thank you for the great idea of using banana clips to hold the binding down,never thought of that and I hate pinning. how cute, I must make some of these. Adding to my evergrowing list! The banana clips are a great idea! Love these! Can't help but think how easy it would be to turn them into cute baby blankets with just a few changes! Fabric.com has plenty of waffle cloth in many colors.